I finally made it to Nusr-Et Steakhouse, the NYC outpost of Chef Nusret Gökçe aka Saltbae, a social media sensation known from the way he cuts meat (he is a trained butcher) and put salt on dishes, falling on his forearm. When it opened several weeks ago, the reviews were not that good: expensive (they do not even serve tap water!) and not good, with some sanitary concerns that could have violated the health code (you should not touch the meat with your bare hands once cooked; Salbae is now wearing gloves). But I admit that, when I went, I found the food excellent, although still expensive, and the evening quite entertaining, each dish being kind of a show. This is the kind of place to do once, if you have the cash of course, for fun, but there are so many great steakhouses in the city that are much cheaper that I am not sure if it will last once the excitement of the novelty passes, unless prices are lowered. As far as Salbae himself, it is funny to see him walking around and do his thing, but it was a bit cold. One of my friends told me that it is because he does not speak english. #salbae old fashioned, made with a single malt whiskey, ginger, all spice dram and bitters. A very good cocktail, perfectly made. For the meal, a glass of Pinot Noir, Bethel Heights Estate Eola-Amity Hills 2015, a robust wine with black cherry notes, perfect with meat. 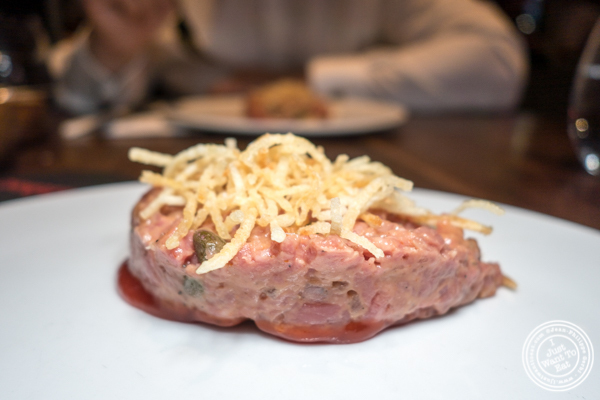 The appetizer was the steak tartare, made with Dijon mustard, shallots, capers, chili sauce, ketchup (what? ), cognac and topped with crispy potato. The tartare is prepared table side like you would see in Mexican restaurants with guacamole, the person going from table to table with a cart. The meat was a filet mignon, cut with a knife, as a tartare should (I hate to see ground meat for a tartare!). I was surprised that they used ketchup, a sort of heresy for such a classic dish and compared to the rest of the ingredients and the mustard kind of overpowered a bit the dish, but it was quite good. I especially loved the addition of the crispy potatoes that added a nice crunch in contrast to the texture of the meat. Next was the tomahawk steak, an impressive piece of ribeye that was mustard marinated and cooked medium. At $275 a piece, it is very pricey and you get the Chef to come and cut it for you...The meat was magnificent: juicy, delightfully charred and very tender, it was quite flavorful. As sides, I tried their rosemary mashed potatoes that were superb, the potatoes mashed skin on, and their sautéed mushrooms. For dessert, there was only one choice: baklava with ice cream and it was again a show! This homemade pistachio baklava is to die for: buttery and with a nice amount of honey, it was perfect with the ice cream that neutralized a bit the sweetness of it. It is one of the best baklava I ever had! The way they serve it is amazing as I would never accept a dessert that has been screwed up like that in another restaurant, but not at Nusr-Et. Last was a Turkish coffee that was good and strong.